Be prepared to be of greatest use to any disaster affected person, and know what might be especially helpful to an artist. Whether you are helping out for an afternoon or in it for the long haul, the Studio Protector can be your resource for making a big difference for someone in need. 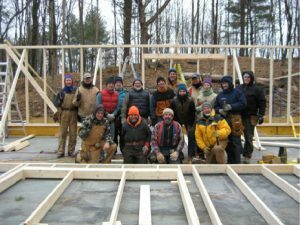 Glass Artist + Beneficiary Ricky Bernstein work with friends to rebuild his studio after a 2008 fire. Be self-contained. Bring your own water and food, and if possible, bring extra to share if it is needed. If you have special skills, come with what you need to perform them, and tell the people you are helping that you are prepared to do that if desired. However, be ready to do whatever needs to be done. Be patient and remember that the person you are assisting is under great stress, and may not know exactly what to do, or what to tell you to do. Remember that your first responsibility as a volunteer is to Do No Harm.